Just keep your head above water; that is my simplest way of defining this first season of Resistance, and this finale. Resistance has been emphasizing small gains in characterization, plot furthering, and accomplishments for its heroes. This approach is exemplified by the way No Escape part 2 concludes all of the slow building the season has done up to this point. In particular the series fixated on the idea of always having Kazuda scrape by; have him get some glimpse of the bigger picture or some minor personal victory. Resistance worked hard from the very first episode to show that the Resistance, and in particular Kaz, are not well off. Throughout the season the audience has known of the inevitable fate of the Republic and the Resistance fleet. Thus the comfort comes from those minor victories, that simple fact that our heroes get by with the skin of their teeth to keep fighting. No Escape as a whole two-parter is about that very self-explanatory title, the whole season the audience and progressively Kaz have been aware of the oncoming storm of the First Order. The latter half of the season being focused on the First Order securing control of the Colossus and showcasing the terrifying way that authoritarians take power not through force overtly, but through making the populace feel powerless or want their power. Even by the end there is no escape from the fact that the First Order is out there and wreaking havoc, the goal for our heroes is to find a way to escape the immediate danger with the goal of combating that inescapable evil of the First Order’s rise to power. The entire season there has been no escape seemingly; so let’s see how Kazuda and our heroes deal with that revelation being made all to clear. The episode opens with a different angle of the end of last episode, followed up by Kaz yelling in panic at watching his homeworld destroyed. Kaz has been progressively more serious these past few episodes, but now he seems to alternate between solemn and desperate for some sense of victory. Both Torra and Yeager cannot say anything to Kaz beyond “I’m so sorry” about Hosnian, the episode has things move on from the attack not by supplanting the drama and tragedy, but by having the need to keep moving and inability to process things be fuel for the feeling of sadness. Upon freeing Doza and Yeager; Torra and Kaz carry out a plan Neeku has to get Stormtroopers into specific corridors and then flood them with the remaining water the station took on, followed by flushing both the water and troopers out. Yet again this series shows just how great it is at using the established rules of the tech and world they have built to make plans feel all the more easy to be invested in. It is with this plan that Resistance does its favorite thing, comedy through utterly brutal implications of death. They do not even try to sugarcoat that the troopers being flushed out will drown, and even more than that we see sharks grab some of the ones currently drowning. Later there is a shark with an empty Stormtrooper in it’s mouth as if the implication of drowning and/or being eaten was not enough. Alas things cannot always be as fun as fascists dying horrible deaths, as Yeager finds out that the First Order is leaving the station and taking Tam with them. Our heroes launch an attempt to slow the First Order down and convince Tam to stay. After an entire season of building up this member of the main cast to the point of her being a secondary protagonist of sorts; Tam’s story has become something of a test to see if this series’ process of slow characterization building will pay off. Team Fireball catches up right as the Upsilon shuttle is landing to pick the First Order up; leading to Kaz, Torra, and Yeager having a standoff with the First Order. Tierny allows the standoff to proceed, really exemplifying how much faith she has in her recruitment of Tam. Tam finally gets the chance to really lay into Yeager and Kaz, pointing out that all they have done is lie to her, and never trust her to be given a chance to prove herself after all she has done. The fact that Kaz has to concede that yes he lied about everything and just simply can ask her to forgive him and stay is heartbreaking and shows how empathetic Kaz really is. He gets that lying or telling her she is mistaken is not going to work, and would just continue to treat Tam as if she cannot make her own decisions. Yeager on the other hand is desperate to keep his new family together, but in his attempt to convince Tam that he does believe in her; he continues to say that only the First Order is lying to her. The contrast between Kaz and Yeager both trying to accomplish the same goal shows just how indirect and relaxed Kaz handles this, while Yeager is passionate and really cares, but cannot see beyond his want to protect his family. In the end the standoff becomes a live shootout as Kaz orders Neeku to finally engage thrusters and take the station into the air, with CB once again cleaning house with some First Order enemies, chucking several troopers off a huge fall. When faced with the shuttle leaving with Tierny’s hand outstretched to her vs Yeager’s pleas for her to stay; Tam chooses the First Order. Somberly Yeager responds to Torra’s question about the First Order taking Tam by saying that she made her choice. Again the show centers back on the theme of having to take whatever victories you can, and just keep moving. Now the station is no longer just a bit above water, but fully out of the ocean, with the new hurtle being the need to escape the literal planet itself. The Aces are freed and Kaz and Yeager head to the hangar to get into their fighters so they can hold off the First Order. As they do their path is blocked by TIEs, only for Hype and Aunt Z to show up and save them in their FO troop transport. They are not able to do much in the way of helping beyond that, but it is that little assistance from those our heroes have helped out that keeps everything going a bit longer. With the fighters in the air the action picks up fully into a massive dogfight with the beautiful setting of the Colossus breaching the clouds. 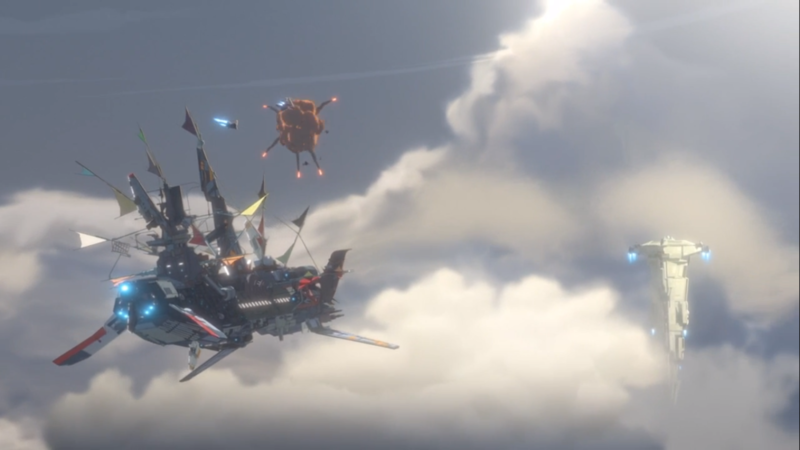 The show was pitched as being about racers and dogfights and while the racers themselves have had little directly to do with the plot, this final fight lets all of them get in on the action. Kaz’s comfort in the sky has been established in depth, but it is great to see it when he is not fighting a giant monster, or trying to escape. Now Kaz can really be a part of a squadron again, and shows his leadership skills that were showcased in The Recruit. Along with Aunt Z and Hype coming to the rescue, Kaz gets one victory and return of a friend as Synara shows up with the Galleon to help. It is reassuring that, while of course more or less doing this for revenge on the First Order and Pyre on Kragan’s part, Kaz was at least right about the good in one of his friends. Poor guy deserved a least that much, plus now the pirates are with the Colossus so that will no doubt lead to some very interesting dynamics. To further cement the metaphor about the Colossus having to again keep it’s head just above something, a Resurgent Class Star Destroyer arrives. This is the first time any of our characters have seen one in person, and likely ever. The scale and sheer might of the First Order is effectively hammered home, as so far we have seen their capacity for subterfuge, grand operations, far away super weapons, but now we see their pure material might literally blocking the Colossus from the sky. Vonreg decides to get in on the action and repeats the first episode by seriously damaging the Fireball and forcing most of the fighters back into the Colossus. Yeager gets Vonreg off Kaz’s tail but only by getting himself in the Major’s sights. Kaz comes full circle as he once again beats Vonreg by adapting to his damaged ship, this time slipping through the Colossus via an opening and cutting off Vonreg, seemingly destroying his TIE Interceptor. It speaks to the desperation of it all that even when succeeding and finally being able to jump to hyperspace, all our heroes literally scrape by with rough landings on the deck of the hangar. As everyone gathers together once the station has made its jump Neeku runs up to reveal that he was not able to fully punch in the coordinates for D’qar that Kaz gave him. They have no idea where they are gonna end up, so it seems Neeku’s clumsiness saved them from running into the Fulminatrix. The episode caps off the season by bringing home the theme of hard fought survival, with Kaz being glad they are all together, save for Tam who they could not get on their side. Everyone left looking off to their uncertain destination, with the wind kicked out of them physically and on a morale front really sums up this first season perfectly. No Escape Part 2 was directed by Saul Ruiz, who manages to convey so much symbolism without being overt about most of it. He lets the spectacle serve its role, and the deeper cleverness become apparent later. He also directs the dogfight as well as he did for the one in The Core Problem, this time in a familiar local. Brandon Auman continues to be the writer on both parts of this finale, and keeps up his handle on just how well he gets Tam as a character. Auman fully sells Tam joining the First Order. While I was already firmly in support of moving her in that direction, Auman has done great work making sure that the proper gravitas is present along with consistent responses from the other characters. 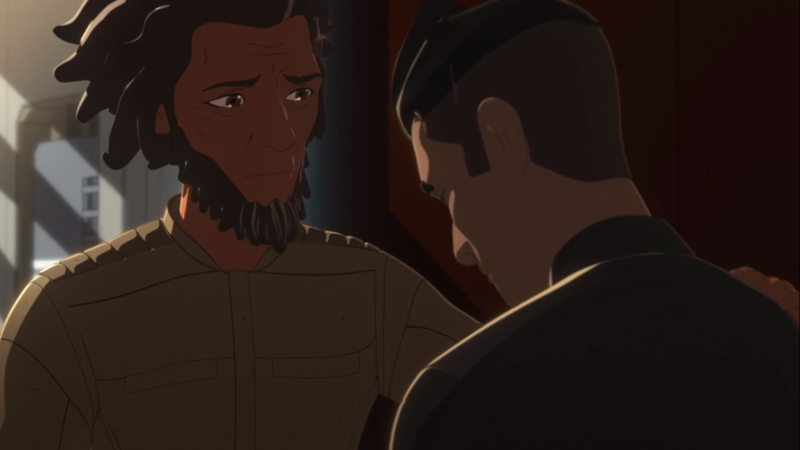 All throughout, as I hope I have demonstrated with these reviews, Star Wars Resistance has been about getting by when utterly outmatched and in a universe in which most people are complacent. Resistance does not give our character’s an out, it simply gives Kaz the chance to fight and accept that for a resistance movement, even victory is going to be more hassle than the enemy’s loss. The lesson of the show is that things don’t just work out, and evil is not always idiotic and slow, and good can be complacent or even betray its own values; and thus in this new conflict the heroes cannot just be ragtag heroes on the run. They have to be a resistance, and thus this hard fought escape is victory, cause it holds the promise of getting to keep fighting. I think above all else Resistance really succeeded with how it treated the brewing war, not just by dealing with geopolitics, but more so in how it did not save the First Order’s evil for special moments, nor the Resistance barely surviving for season endings. The daily life of our hero has been one of constant struggle, and because of that we have really seen him grow. 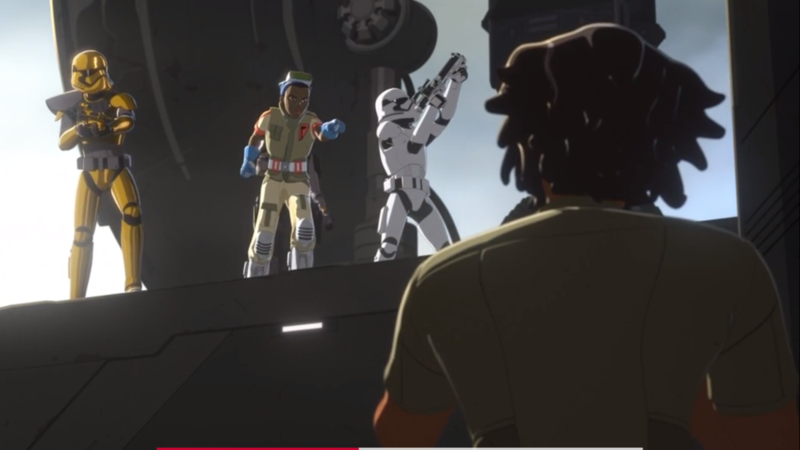 Star Wars Resistance season 1 has been a triumph, and has made this thus far my favorite of the animated Star Wars series. The characterization and ability to be more mature than even the more overt moments of Clone Wars, earns it that spot.